The value of pipe #546 is 57 points. Ah! The rewards of collecting pipes despised by most smokers! The legendary Bert Bruning, owner of the Palm Desert Tobacconist for many, many years, found a cache of Venturi, Inc. pipes from way back when in his shop. He contacted me by E-mail and offered to sell me the lot - 23 pipes altogether. (It turned out to be 22 after he decided to keep one to smoke himself.) We made the deal and he sent me all these never-smoked pipes. After he sent me the package, he wrote again to ask to buy one of them back because he was enjoying the one he kept so much. Since the one he wanted back was one with literature I offered to sell him an identical un-smoked pipe from my collection and again a deal was made. These pipes are all factory fresh except THE SMOKEs which have all been thoroughly reconditioned and are like new. Twelve of the 22 joined the collection as new or better examples of the shape/color and the other ten are offered on the Pipes for Sale page. This is one that's now a Pipe for Trade, but since it has never been smoked I won't be the first to light it, thus preserving its value as a collectible. Sooner or later someone will offer me something really super for it. 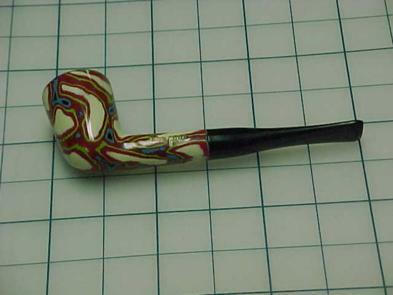 Sure enough, Bill Moore offered me an un-smoked Made In England Briar Billiard for this one. Hurts my heart to part with this beauty, but the collection is improved by the swap.